It’s about time we featured Nevada-based Lance and Danny Busch. 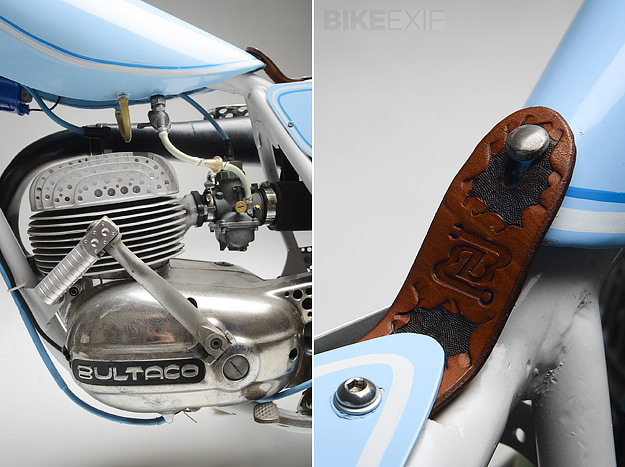 And this stunning Bultaco is the perfect introduction. Busch & Busch is one of those shops with no discernible signature style, but every build seems to ooze cool—whether it’s a Honda ATC turned into a raked-out chopper or a 70s Kawasaki 175 enduro transformed into a road-going lanesplitter. 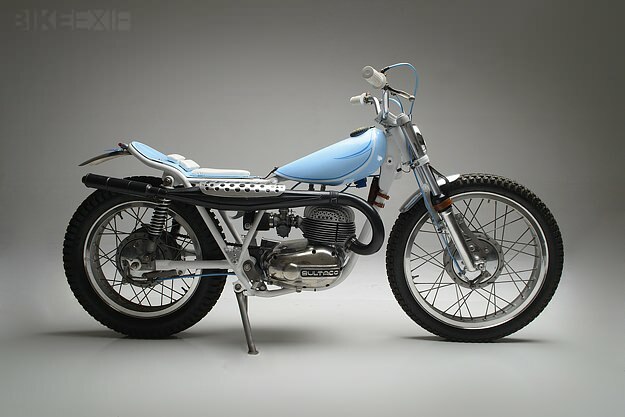 This pale blue beauty started life as a Matador 250 Mark III—Bultaco’s own version of an enduro, first introduced in the mid-60s. It bears a passing resemblance to a Sherpa, because of the tiny tank and low seat, but the frame is about four inches wider at the back, and the engine is geared much higher. 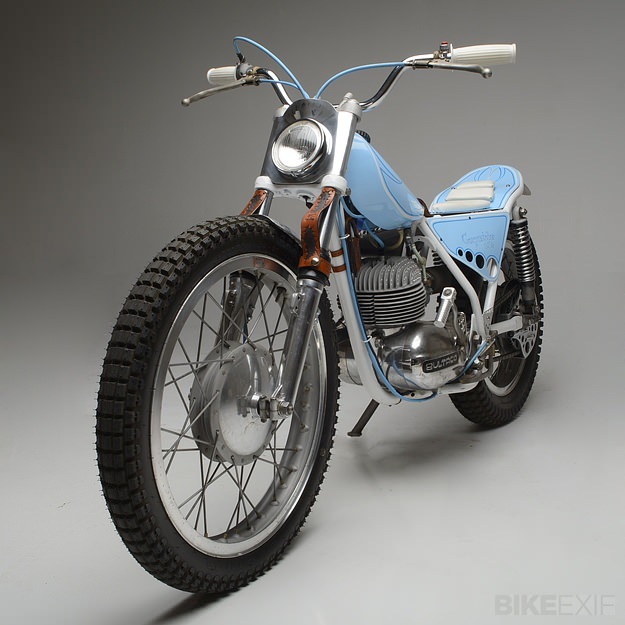 Lance Busch reckons this Matador was built somewhere around 1970: “Bultaco never really dated their models, they just put serial numbers on them,” he notes. 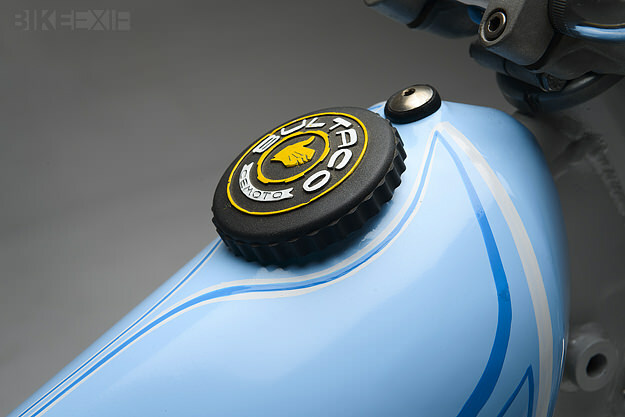 B&B also made the front ‘number plate’ and stuck a Puch moped 4” headlight in it, with an LED bulb behind the lens. (“Does it illuminate the road? 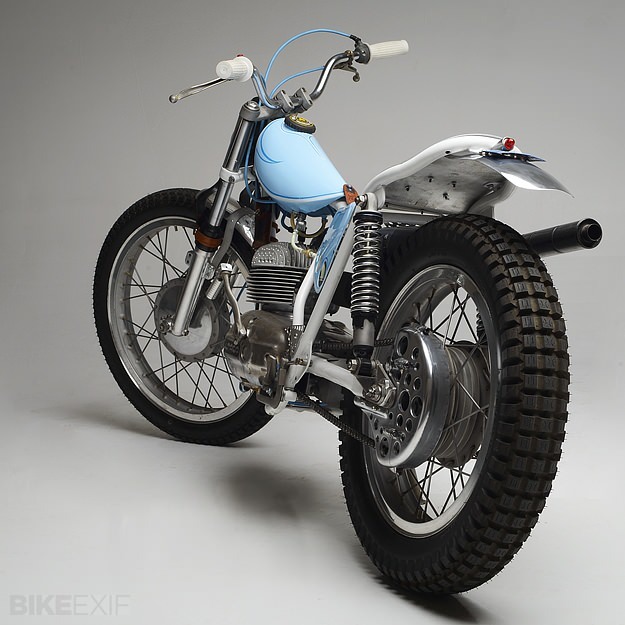 Hell no, but I never ride at night …”) Danny Busch hand-formed the aluminum fenders and machined the kicker and the ‘thumbs up’ snail adjusters at the rear. 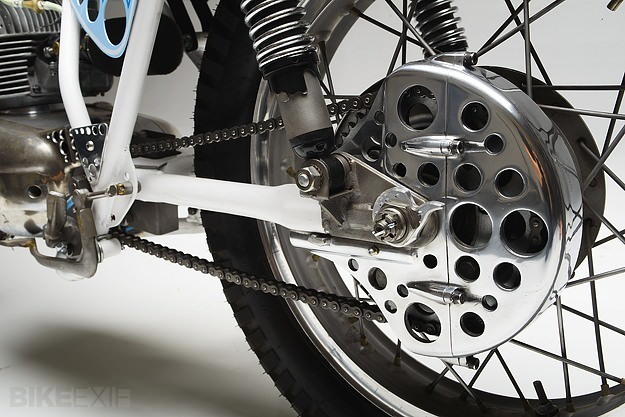 Meanwhile, Lance took the drill to every piece on the bike that he could, including the heads and the enclosed chain guard, and fabricated the heel guards and exhaust heat shield. “Half the aluminum parts are bead blasted and the rest polished. The bare steel was blasted as well. We did the paint and striping to evoke a custom 60s look, and tooled all the little leather bits on the bike—like the fork guards and spare plug/wrench holster,” says Lance. The Matador is now lowered a few inches front and rear, and running trials tires for a smoother ride on pavement. The only engine work was a cylinder honing, but the stock carb was swapped out for a 28mm Mikuni. “The bike rips, and that’s what really matters!” says Lance. Head over to the Busch & Busch website to learn more about these talented brothers, and check out their latest projects on the B&B Facebook page. Images by Asa Gilmore.